As part of the ICAT Day, VT Institute for Creativity, Arts and Technology (ICAT) and School of Performing Arts' Digital Interactive Sound and Intermedia Studio (DISIS) presents aconcert of interactive computer music and fixed media, featuring performances by special guests, including Carla Scaletti, an American harpist, composer, music technologist, and inventor of the Kyma Sound Design Environment, Ronald K. Parks, composer, and computer music researcher at Winthrop University, pianist Tomoko Deguchi, and the Linux Laptop Orchestra (L2Ork). 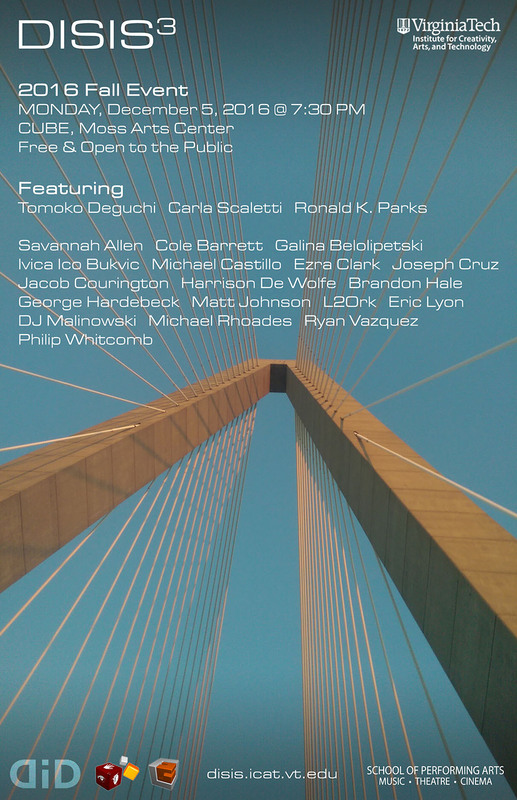 The event will also feature pieces by faculty composers and students. "Digital iD" offers an exploration of synergies among music, technology, arts, gesture, collaboration, interactivity, and ultimately community. The event is free and open to the public.